The rich flavor, juiciness and tender texture of lamb kidneys adds robustness and depth to a dish. Common uses include chopped up in meat pies as well as quickly sauteed. 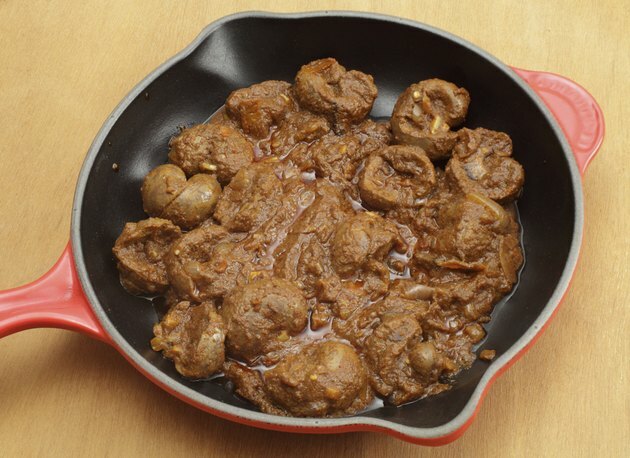 Inexpensive, lamb kidneys are a good source of protein, although they are high in cholesterol. A 4-ounce serving of lamb kidneys has 110 calories and 17.8 grams of protein. Protein is required to maintain, make and repair the body's cells, and it forms an important part of your skin, muscles, glands and organs. It's also present in almost all bodily fluids. The recommended dietary allowance of protein is between 46 and 71 grams for all adults. A 4-ounce serving of lamb kidneys is low in fat, with only 3.3 grams of total fat for the entire serving, but very high in cholesterol, with 381 milligrams. While the majority of the fat is unsaturated, a single serving still has 1.1 grams of saturated fat. The American Heart Association recommends that saturated fat make up no more than 7 percent of your total calories per day and that you eat less than 300 milligrams of cholesterol per day. If you have a history of heart disease, take in no more than 200 milligrams per day. Lamb kidneys are rich in iron, an essential mineral. A 4-ounce serving contains 7.2 milligrams of iron. This is 90 percent of the daily recommendation for adult men of all ages and women who are 51 and older. It provides 40 percent of the recommendation for women who are 50 and under. Iron is essential for producing blood cells. It helps make hemoglobin and myoglobin, which help carry oxygen throughout your body. A 4-ounce serving of lamb kidneys has 59.2 micrograms of vitamin B-12 per serving. This is well over 100 percent of the daily recommendation for all adults, which ranges from 2.4 to 2.8 micrograms per day. Vitamin B-12 helps your body maintain its nerve and blood cells, as well as helping in the production of DNA. It can also help prevent anemia, a condition that can leave you feeling tired and weak.